Interdisciplinarity, collaboration and the growth of tissues & researchers in the lab, inspire me most. Click here for Master student internship. Debby Gawlitta was trained as a biomedical engineer at the Eindhoven University of Technology (TU/e), specializing in tissue engineering and biomechanics. As part of her training, she visited the lab of emeritus prof. Nerem at Georgia Tech in 2001, to work on mechanical characterization of engineered vascular tissues. Back at the TU/e, she received her PhD for studying compression-induced damage development in engineered skeletal muscle tissue in 2007. In her first postdoc she started working on bone regeneration from multipotent mesenchymal stromal cells (MSCs) in the UMC Utrecht, dept of Orthopaedics. 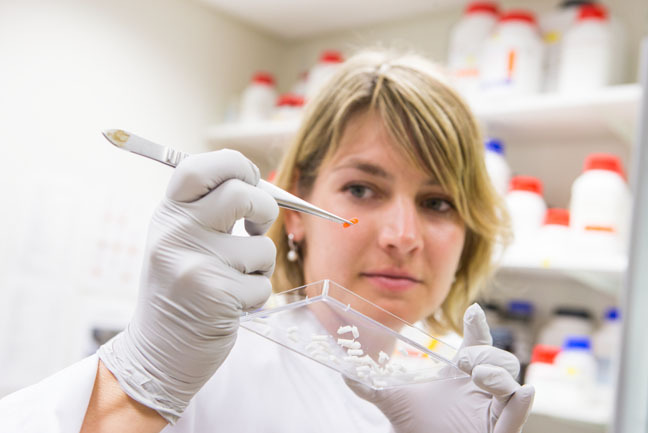 Her creative approach in the endochondral bone regeneration field was awarded a prestigious Dutch innovation grant (Veni) in 2010 that provided the opportunity to integrate biomedical engineering, stem cell differentiation, biomaterials, bioreactors, 3D bioprinting and translational animal studies. In the same year, she was involved in the development of a new Master’s program within the strategic alliance of Utrecht and Eindhoven institutes. Ever since its launch in 2012, she has been coordinating this successful NVAO-accredited program that continues to increase its popularity. In 2014, she was appointed at the dept of Oral and Maxillofacial Surgery to head the department’s research on bone regeneration. We are a young group working on bone regeneration of the facial structures. Patients with maxillofacial bone defects need bone tissue substitutes to reshape their face, to speak and to anchor teeth for chewing food. These bone defects may arise from an accident, cancer, infection or due to congenital malformations. Our team focusses on creating bone tissues in the lab from stem cells that can be harvested from adults. We combine stem cell technologies with state-of-the-art regenerative technologies to recapitulate natural tissue development and regeneration. Further, in collaboration with Xpand Biotechnology BV, we investigate bone regeneration from smart bioceramics in cell-free approaches in the preclinical and clinical setting. Keywords: 3D bioprinting, biomaterials, multipotent stromal cells, dental pulp stem cells, endothelial colony forming cells, stem cell differentiation, clinical translation, bioreactors, and animal models. Gelatin-Methacryloyl Hydrogels: Towards Biofabrication-Based Tissue Repair.Klotz BJ, Gawlitta D, Rosenberg AJ, Malda J, Melchels FP. Trends Biotechnol. 2016 May;34(5):394-407. Endochondral bone formation in gelatin methacrylamide hydrogel with embedded cartilage-derived matrix particles.Visser J, Gawlitta D, Benders KE, Toma SM, Pouran B, van Weeren PR, Dhert WJ, Malda J. Biomaterials. 2015 Jan;37:174-82. Flow-perfusion interferes with chondrogenic and hypertrophic matrix production by mesenchymal stem cells. Kock LM, Malda J, Dhert WJ, Ito K, Gawlitta D. J Biomech. 2014 Jun 27;47(9):2122-9. Properties of engineered vascular constructs made from collagen, fibrin, and collagen-fibrin mixtures. Cummings CL, Gawlitta D, Nerem RM, Stegemann JP. Biomaterials. 2004 Aug;25(17):3699-706.